This interview is with Rose Gottemoeller, NATO’s deputy secretary general and the first woman to serve in this position. Gottemoeller is the former U.S. undersecretary of state for arms control and international security, and served as the chief U.S. negotiator of the New Strategic Arms Reduction Treaty (New START) with the Russian Federation. Is it important to NATO’s interests to advance women’s participation in peace and security efforts? NATO has been the most successful military alliance throughout history, but attention to the role of women in security has not always been at the top of NATO’s priority list. In recent years, we have seen that stability, security, and conflict resolution only come about when women are fully engaged and able to work together with their governments and to work together with us to ensure that problems get solved down to the level of the village and the local government. Women are the ones that can really make a difference in resolving security problems. It is very important to work with women’s groups, and women in the community, and it is equally important to work with our partners to ensure that their armed and police forces are trained to recognize this as well. A growing body of evidence suggests that women’s participation in conflict prevention and resolution improves outcomes. In your experience, how does women’s participation in peace and security efforts make a difference? We see this every day in Afghanistan. 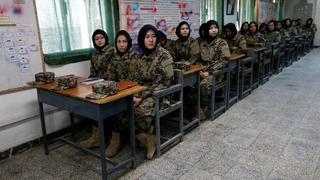 NATO is engaged there now in a training mission—the Resolute Support mission—where we train women in the police forces and in the Afghan national army. We understand—from many years of training and also from our previous mission in Afghanistan—that if women are engaged at the level of local villages and regional governments, we can make faster progress in terms of bringing peace and stability to Afghanistan. You have been party to high-level negotiations and policy debates in your current role at NATO, as well as in your previous role in the U.S. government. What advice do you have for other women looking for a seat at the table? For anyone who joins negotiations, it is important to be well prepared, have both answers and arguments ready, and never apologize for your arguments. I do find that young women—and I did it myself when I was a young graduate student—often will begin their phrase by saying “well, I really may not know much about this.” They apologize, in other words. I always give the advice to never apologize. Just bring out your argument, put it on the table, and then fight it out. What is the status of women’s representation in foreign policy and national security positions? I do not believe that women are underrepresented everywhere in the national security establishment. It depends on where you are. When I was working in the White House, for example, in the 1990s, I convened meetings to help the former Soviet Union protect its warheads and fissile material. There were plenty of women around that table making some really serious decisions. Today, those very same women are spread throughout academia and in other national security positions. It really depends on what period you are talking about, what national security entity you are talking about, and what the overall policies of the government are. In your experience, what factors have supported women’s participation in foreign policy? In the United States in the 1990s, I think that we were witnessing a growing support for more diversity in the workplace—not only for women but also for people of color. People recognized the importance of ensuring that everyone gets a fair chance to come to the table, to enter the workforce, and to work. There was actually a great deal of attention to this in the 1990s. I have to underscore that these matters require attention. Even today, if we lose attention and start forgetting the importance of diversity at any table—whether it’s a negotiating table or a decision-making table in government or in business—we risk backsliding on these important matters. Read more about NATO’s efforts to promote women’s contributions to security and explore an interactive report on women’s participation in peace processes.